Our product range includes a wide range of pvc nail polish box, custom nail polish box and nail polish packaging plastic box. We have emerged as a leading organization, engaged in offering superior quality PVC Nail Polish Box. 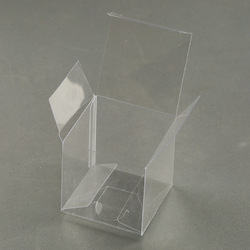 The offered box is widely demanded for packaging purposes in order to prevent from damage. Offered box is precisely manufactured as per set market norms by utilizing quality assured polypropylene and the latest machines at our advanced manufacturing setup. Moreover, the offered box can be purchased from us at reasonable prices. We are a remarkable entity, actively committed towards offering a wide range of Custom Storage Box Nail Polish to our customers. Our offered products are uniquely designed in compliance with the international quality standard using optimum quality material and advance technology. Further, we provide these items in diverse finishes and specifications in accordance with the details provided by the clients. Further, these are precisely polished in order to equip them with forever lasting shine. Owing to our state-of-art manufacturing unit and cutting-edge technology, we are involved in manufacturing and exporting a classy range of Nail Polish Packaging Plastic Box for our prestigious clients. Keeping in mind, demands from our valuable clients, these products are manufactured by our expert designers using high grade raw material and sophisticated techniques. We assure our customers that our products fulfill every international parameter of quality control.